The first thing you notice about Akwasi Yeboah in-person might be his hulking 6-foot-6, 235-pound frame, draped in his No. 15 jersey, or perhaps it’s his thick British accent. However, his intensive drive for leading Stony Brook Men’s Basketball to victory instantly stands out among the other nine men playing on the court. 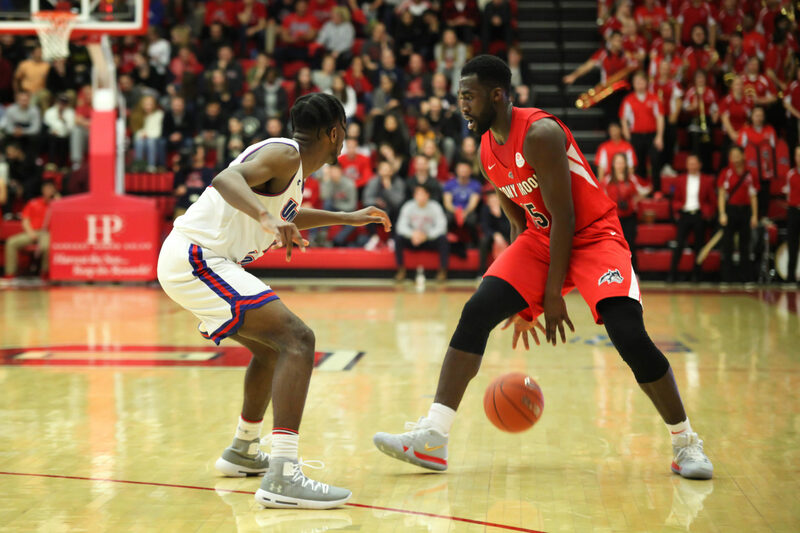 Yeboah, the redshirt-junior forward from Chigwell, England, has not only emerged in his third season as a leader for the young Seawolves team, but as one of the top players in the America East conference and Division I mid-major basketball. On a team that currently boasts a 20–5 record and 11 true road wins, the most of any Division I program in the nation, Yeboah has made an impact in all facets of the game. Entering Wednesday’s matchup at Binghamton, Yeboah was averaging 17.2 points per game, the highest of any junior season in Stony Brook history. Former forward and current Westchester Knick Jameel Warney, who holds numerous school records, only averaged 16.4 points per game in his junior year. While one of the most prolific scorers in the conference, Yeboah’s skill set extends far past just putting points on the boards. He excels at pulling down the opponent’s missed shots and using the momentum to turn the wheels of the Stony Brook offense. Yeboah’s 7.7 rebounds per game rank third in the conference, and he has already recorded eight double-doubles this season, including a season-high 14 rebounds off the heels of 16 points during last Saturday’s matchup against Hartford. Even when held to a full-game season low of nine points Wednesday at Binghamton, he managed to nearly record a triple-double, with eight rebounds and six assists. Yeboah is the last remaining recruit of former head coach Steve Pikiell, who left Stony Brook in 2016 for the same position at Rutgers. While the Seawolves advanced to their first-ever NCAA Tournament that year, Yeboah redshirted the season and studied from the bench. He made 10 starts in his rookie season, averaging 9.5 points and earning a spot on the conference All-Rookie Team. His breakout game came against Binghamton in the first round of the America East Tournament, putting up 21 points and 16 rebounds, both career-highs at the time and the latter of which still stands. In his sophomore season, Yeboah led all Seawolves with 15.3 points and 5.1 rebounds per game. He scored 489 points, the seventh-highest single-season total and second-highest for a sophomore behind Warney’s 494. He has taken his game to the next level this year and earned the Lou Henson National Player of the Week award in December, rewarding the top mid-major player of the week. During non-conference play, Yeboah recorded 23 points in four consecutive games. However, his season came to a scary halt on Dec. 22, 2018 against Quinnipiac when he suffered a hyperextended knee three minutes into the game and was subsequently removed. After missing one game, Yeboah returned to the lineup to begin conference play but sported a knee brace, which notably limited his performance. Since the injury, he has averaged only 14 points per game, compared to 20 before. However, the brace was removed prior to the Hartford game, hopefully indicating that Yeboah’s knee is recovering. Through two and a half years at Stony Brook, Yeboah has established himself as one of the greatest players to ever put on a Seawolves uniform. His career points total currently stands at 1,183, the seventh-most for any player in the Division I era. When he broke the 1,000-point milestone earlier this season, all of Island Federal Credit Union Arena rose to their feet to recognize the feat.